his is not a classic Behind The Music story by any means. It is rather one that speaks to the resiliency and resourcefulness that people can acquire in pursuing creative goals. 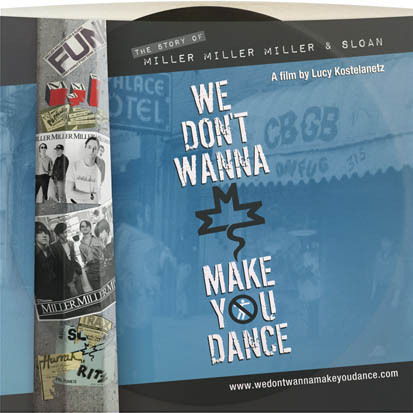 In 1983 Lucy Kostelanetz filmed the band, Miller Miller Miller and Sloan, when they were still in their teens and very hopeful that they would "make it". They had a large and enthusiastic local following in New York City, including many of their Music & Art classmates. The film captures that moment in time with scenes from rehearsals, home interviews, and best of all performance and backstage footage at CBGB. In 1988 Lucy went back to see what had happened to them. They were still performing and trying to stay together. But the realities of life and earning a living were starting to erode the dream. And, most discouraging of all, the "record deal" which was required of bands at that time for any hope of success, continued to elude them. By 1993 the Band dissolved. In 2007 Lucy reconnected with all the former band members, curious to see how that "dream" and the enormous amount of time and work they had put into trying to make it happen might have played out in their eventual lives. Only one of the former band members has continued to pursue the dream. Although now with the Internet, the challenges and possibilities are totally different. The others have incorporated the experience into their careers in surprising and interesting ways. © 2013 - 2017 Lucy Kostelanetz Productions, LLC All Rights Reserved.